Pop quiz, people: Fahey, Woodward and Dallin are better known as? That aside, it's a midday run for the good fellas to see what's showing at the F'lix. The mission: to visit every darn coffee shop on Big F's mean streets. Today's taxi driver transports us to the city by the sea and everybody's fine as we glide past Silks and the Baker's Oven to number 59, Hamilton Road. In we go: it's showtime. 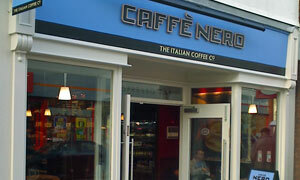 Despite no mention on their official website, this place has been open for a full five days: yes, we've kept Caffe Nero waiting, serving Italian coffee. As revenge, they'll keep us waiting too, while the trio of trainee baristas go inefficiently about their business. U may normally follow a Q, but I 8 M. Minutes pass, then I pay for my San Pellegrino limonata (wot no chinotto) and hand over my bread product for them to toast. In return, I'm given a lovely tactile and smooth wooden block with my lunchtime number. Initially we take a utilitarian table at the rear before landing prime comfy chairs by the permanently open doors. Not long to wait for my heated dough, a mundane meatball and mozzarella panini; Andy's lasagne looks better. BTW, there's talk that the shop opened without the requisite change-of-use permission. No grande deal, perhaps, 'cept that the very same issue forced the closure a year or two back of Puccino's, a very popular coffee shop over the road. Surely they wouldn't burn this down due to Nero's fiddling? Back into smaller queue for the caffeine and cake component. One sizeable plus point for CN is the quality and strength of the coffee, partly due to the inclusive two (count 'em) espresso shots. If the lady in front had asked for a single shot, I might have had hers too. Much like Costa, you know what to expect with such a heavily branded chain: let the folk of Felixstowe be grateful that this isn't Jimmy Starbucks. If it was a car -- Europcar Vauxhall Astra. If they were passing by -- Christine Bleakley.